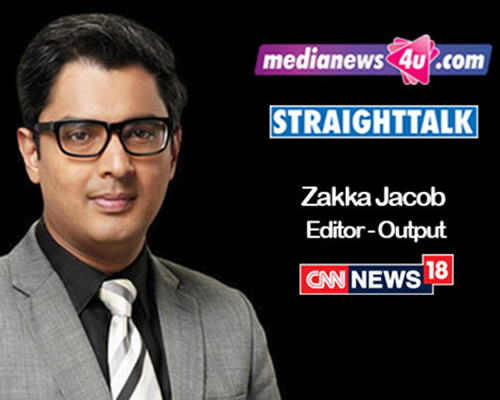 Zakka Jacob is Editor-Output of CNN News18. He manages a newsroom of more than 100 people and anchors during the channel’s flagship primetime show, Face off Tonight. Zakka recently received the Asian Television Award for Best News Anchor in Asia. He is the only Indian TV journalist to have won this prestigious award twice — first in 2016, and then in 2018. In this conversation, Zakka talks about how his prime time show Face off Tonight, the upcoming election campaign, differentiation factors for news channels and much more. How do you differentiate your show, Face-off Tonight from the other prime-time shows across other news channels? What drives viewership for the show? Face off Tonight is about people’s issues. It takes the viewer beyond politics. It’s not just about politics but how it directly affects your life. It’s also about holding those in power accountable. So it’s not like your regular shouting match on TV. Congratulations on the long list of awards. Being the output editor of CNN-News 18, how do you cope with the constant pressure of a TV newsroom? I got the opportunity to become the Output Editor about eight months ago. It’s been an honour to lead the team because it’s young, energetic and full of ideas. I am just an enabler, giving them the required direction, and that little push to transform the ideas onto the screen and see the result of their hard work. The pressure is always there but the most important thing is people management. If your people are happy, if your team is happy, then you will also be happy. How are the panellists selected for your show? We have a morning editorial discussion about the biggest stories for the day, which are the stories to focus on and what will each of the prime time shows 8 PM, 9 PM and 10 PM do. Then the respective producers of each show along with guest coordinators get in touch with individual panellists to get them on the show. How did you earn the moniker “thinking man’s anchor”? Haha… I frankly don’t know. I think people were sick of watching shouting matches on TV, the whole pandering to the least common denominator which gets passed off as debates on TV. That doesn’t happen on my show. So the first thing people notice is that no one is shouting on this debate show. When no one is shouting you can hear what the other person is saying and make intelligent counter-points. That’s perhaps where this moniker ‘thinking man’s anchor’ came from. How was the year 2018 for CNN News 18? Did you achieve what you had aimed to do in the beginning of the year? It was an absolutely fantastic year for the channel both in the kind of stories we did as well as ratings. We are now a solid No.3 channel, ratings wise. When 2018 began we were struggling with ratings and there was a leadership vacuum in the newsroom. I’m glad I have played a small part in fixing both these issues and managed to turn around the channel. I am now looking forward to the upcoming election which, we believe will be our best election coverage yet for CNN News18. Broadcast news is a very difficult space to survive in, and with the new tariff regime now rolling out, what are your thoughts overall? Frankly this (New Tariff Regime) is a game changer. We at CNN-News18 are uniquely placed in that we are part of the largest News Network in India with 14 regional channels, with Hindi and English. So if a viewer in Tamil Nadu or Bengal or Odisha wants to watch our regional channel there, then he or she can subscribe to our News18 package and get the entire gamut of news channels from the News18 family. We are also the only news network in the country which has an entertainment network in the form of Colors. So if you subscribe to the Colors family pack at just 35 rupees a month you get the entire gamut of channels that this network owns. One can also subscribe to CNN-News18 at just 50 paisa per month. It’s completely paisa vasool! How can news channels differentiate their content in order to be chosen by the consumer in the subscription driven times, because essentially news is the same across with just the difference of perspective. I think viewers are coming for differentiated content. There will always be an inherent curiosity for news. People will always be interested in what is happening around them. People have been saying newspapers are dead for the last 20 years but those same people are still reading newspapers. So I don’t think the new subscription model is going to spell the death of News TV. On the contrary I think it’ll be good for news channels because it makes us a little less dependent on advertising revenue. So it will only help. Do news channels these days change or colour a viewer’s opinion of a particular subject? If yes, then is that ethically correct? If no, then does sensationalizing every news item is what helps the channel sell? No I don’t think news channels change the perception or opinion of the viewer on a particular subject. What it can do is just validate one’s opinion. If you believe something is true, and if a channel is also saying the same thing then it validates what you already believe in. So Yes, TV channels have the power of shaping opinion or setting the narrative, but more it’s more about validation than the power of changing one’s set beliefs. For example, if you believe climate change is a hoax, then no matter what a news channel says to the contrary you won’t believe it. How do you plan to continuously keep on improving your show, Face-off Tonight? As a channel and as a team, we are looking forward to the upcoming elections. Elections are like the Kumbh Mela for news channels. Maximum viewership and maximum revenues for news channels come at this time. We’ll be unveiling some of these plans as we get closer to the elections so you will have to tune in to CNN News18 to know the same. I’m afraid I won’t be in a position to disclose our plans right now but they are at the cutting edge of election technology. As a senior member from the editorial team, what are the editorial plans for this year? Can we expect any innovations in the way news can reach the audience or maybe created? We introduced some new election tools in the last Assembly elections in December, like Magic Wall and Elex-A. We will be scaling all these election tools up and taking them to a different level for the upcoming general election. So stay tuned.